Ever since its founding in 1858, Denver has served as a hub for people passing from one destination to another. Because Denver has no navigable rivers, its destiny was instead carved out by the evolution of the railroad. Although the work involved in constructing a mountain passage initially made railroad builders wary, by 1870 both the Denver Pacific and Kansas Pacific Railways ran through town. We can experience this nexus of traffic today by visiting Union Station in Denver’s LoDo neighborhood. However, with many new buildings in this area of the city, it may take some imagination to recall what transportation looked like in this warehouse district once lined with buildings made from brick and timber. Here are some things you might not know about Union Station that are sure to help spark your curiosity. 1. 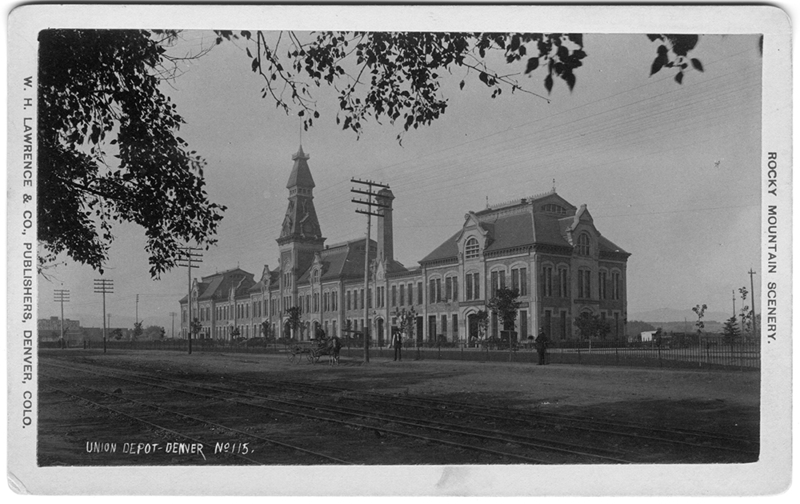 When it was completed in 1881, Denver’s Union Station was the largest structure in the West and included a 128-foot tower. Its grandeur was perhaps paralleled only by the rapid development of the state’s rail system, which grew from 328 miles of track in 1870 to half a million miles by 1900. 2. A chandelier in the ladies’ room caused a devastating fire in 1894. The fire led to a redesign in 1914 that included a central area with wrought iron and glass. The restoration of this distinct canopy was part of the work funded by History Colorado’s State Historical Fund before the renovated station reopened in 2014. 4. Passengers used to board trains underground. Within the first twenty years of the station’s operations, trains went from hauling four to six cars to fourteen or fifteen cars. Passengers sometimes had to wait for other cars to unload or board before exiting or entering a car themselves. In 1912 an underground boarding area was constructed. This change better served Union Station’s patrons—especially during World War II, when the station accommodated twenty-four thousand people a day, mostly soldiers. There remain some unused underground passageways today. 5. A bilingual “Welcome” sign once greeted travelers. 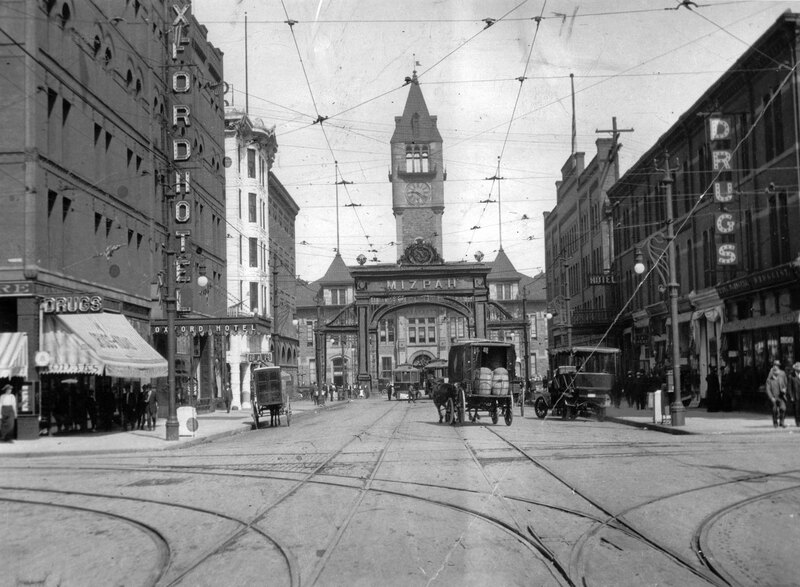 As a tribute to Denver citizens, in 1906 the city erected what became known as the “Mizpah Arch” over the Seventeenth Street entrance to the station. When Mayor Robert Speer first dedicated the arch, it said “Welcome” on both sides, but later the sign said “Mizpah” as visitors entered the station. Mizpah is Hebrew for "watchtower" and signifies an emotional bond between people who are separated. The metal arch shone with 2,200 electric bulbs that gave visitors a warm welcome, not unlike the lights that now set the station aglow at night. The arch was torn down in 1933, but you can still find the two benches that mark where it once rose. 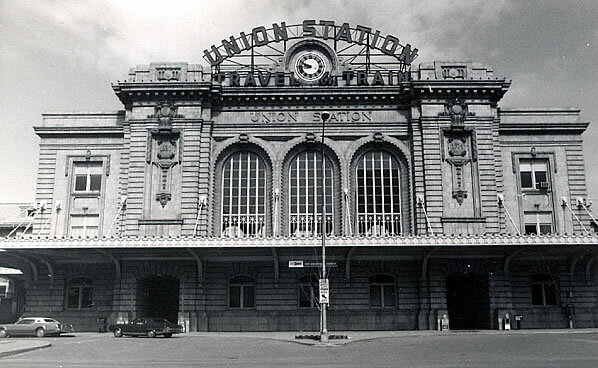 Denver's Union Station is an example of the Beaux Arts style. 6. The “Travel by Train” sign references an era that had already passed. As the use of automobiles rose, Denver’s focus shifted away from rail. By the 1950s the trolleys that had traveled up Seventeenth and Wynkoop since the 1880s stopped running, and passenger air travel started taking off as well. In 1953 Union Station installed the sign “Travel by Train” almost as an homage. Even the beloved Ski Train went in and out of service over the decades that followed. In 1974, the station was listed in the National Register of Historic Places. Are you an educator? Learn about our guided walking tours including Union Station and other destinations in LoDo!